On this date in 1939: Charles Sberna was executed in Sing Sing Prison’s electric chair. Though convicted of participating in the killing of an NYPD officer, many to this day insist that he was innocent. As the son of a fugitive wanted for orchestrating a series of bloody anarchist-terrorist bombings and the in-law of a family of Mafia leaders, could Sberna possibly have received a fair trial? 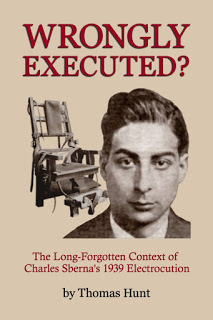 ‘Wrongly Executed?’ provides the details and historical background of the Sberna case. The story is a complex and controversial one, involving celebrity attorneys, underworld bosses, violent political radicals, media giants and ruthless establishment figures, all set in a period in which Americans sought stability and government-imposed order after years of political upheaval, economic depression and Prohibition Era lawlessness.